This summer we were in hot Lebanon again and made up a new recipe. And as always scarcity brings out the best ideas. When we found in the our friend Tamar’s kitchen a cauliflower and the superb Lebanese lemons (they’re like the famous Amalfi lemons or Sicilian lemons from Italy) a new dish was born: a cold summer couscous from finely grated cauliflower, lots of lemon juice, lemon rind, salt, fruity green olive oil and a generous amount of golden fried chopped pinenuts: there you go! The cauliflower is fresh and crunchy, the lemon juice fresh and aromatic, the olive oil gives a fruity taste and you end with the nuttiness of the pinenuts and preferably some fleur de sel or flake salt. At Souk el Tayeb’s Tawlet restaurant in Beirut we prepared it again, and it was an instant success and it remained that way anytime we do it. 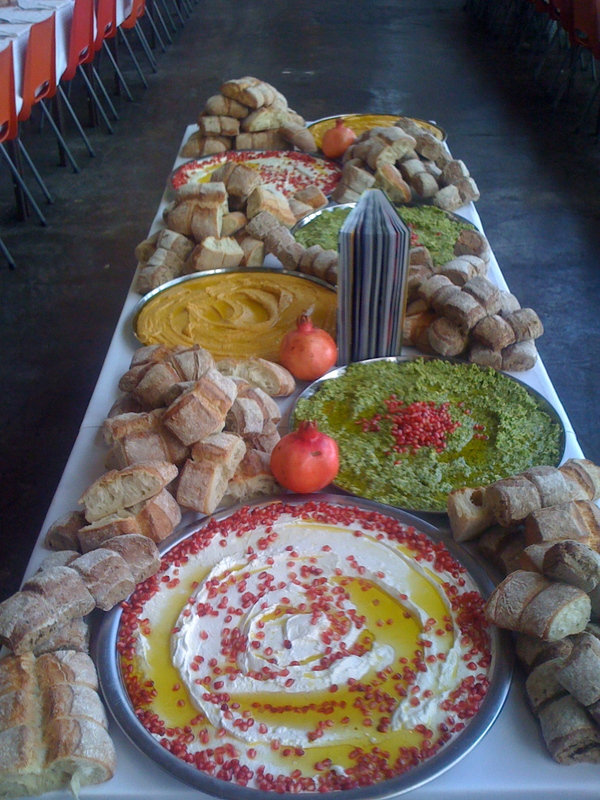 This coming Friday it will be part of our Middle Eastern Christmas buffet for the Christmas shoot for the Dutch delicious. magazine. Mmm…delicious.! 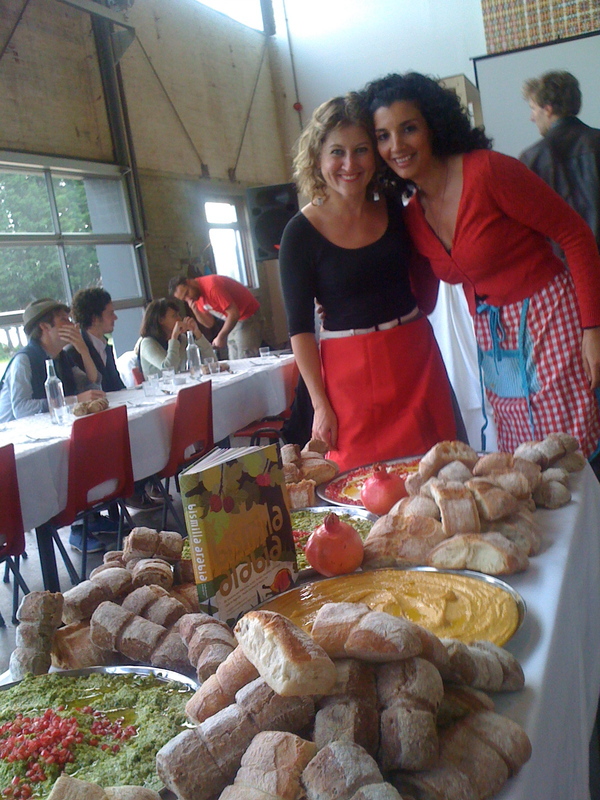 Yesterday we made some nice dips from Bismilla Arabia for the Dutch Youth Food Movement 1th anniversary dinner: we roasted the pumpkin in the oven instead of steaming (like we do in the book), which made it more nutty, then pureed the whole batch. We left the skin on, but it turned out to be too coarse, so we pressed it through a sieve: mixed with the tahina, olive oil, salt and some lemon juice, it turned out to be the most delicious. silky pumpkin hummus, just like we know it from both Israël and Palestine. On the side creamy salty labne with lots of pomegranate seeds and some olive oil from Lebanon, and the course Turkish style paste of pistache with parsley, white salty cheese, a little garlic and a green olive oil. Guys we got greedy again ourselves, dipping away with rustic bread. As good as with the usual flatbread! 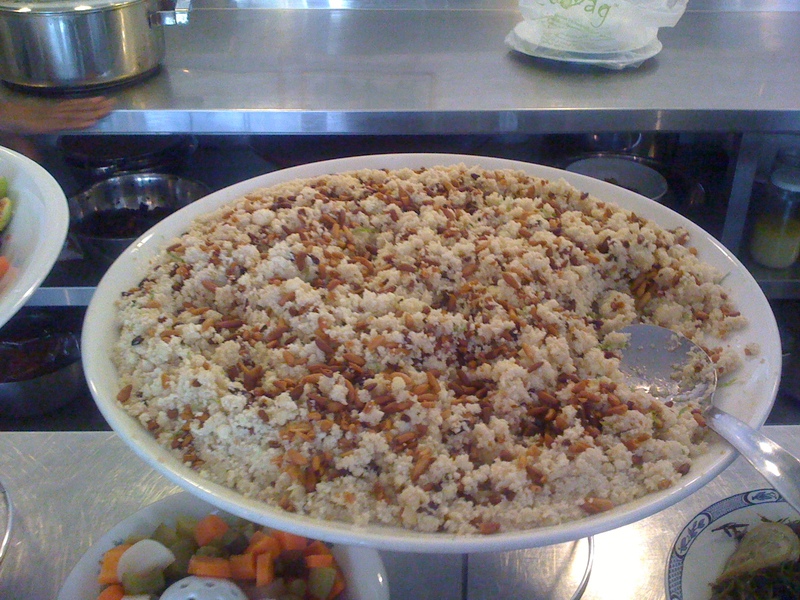 As we have severe Arabia food addictions, we often seriously crave certain foods. You know, all of sudden we have this vivid memory of a sunny morning in Batroun, Lebanon, having breakfast with our Lebanese friends, with fresh man’ouche from the bakery around the corner: one of these simple almost sleazy places, where there’s not much more than a superhot oven in the corner of the room, and the rest is quite dusty. 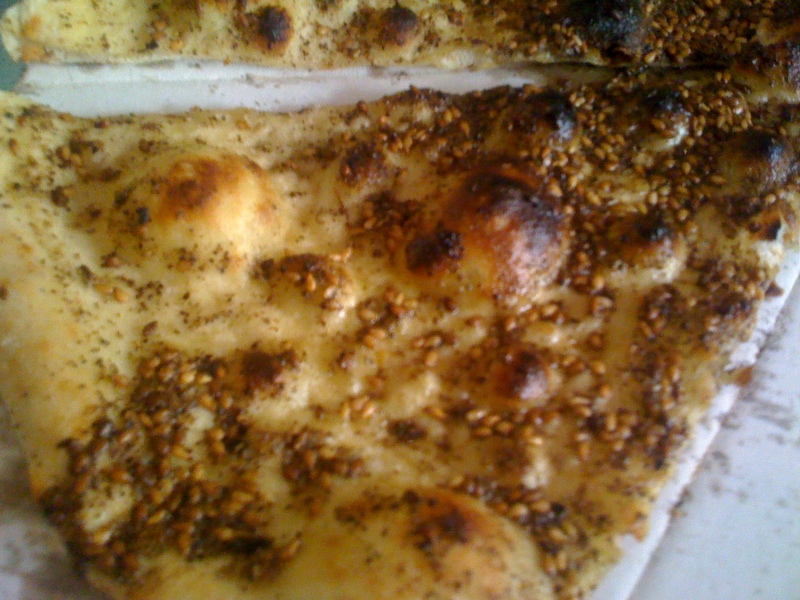 But out of it come superb crusty golden thin man’ouche with generous amounts of herby za’atar on it mixed with oil (za’atar being the mixture of wild thyme, sesameseeds and sumak). So we find ourselves with mouths full of saliva back here in cold rainy Amsterdam. But we have za’atar at home. And we have a delicious. Napoli pizzabaker around the corner with a very very hot stone woodoven. So we start thinking, one and one is two. As we arrive with our little bag of za’atar, they look at us in typical Italian astonishment (we think our Lebanese baker would look the same if we arrived in his place with some tomato sauce). What do we want? We want this green stuff mixed with oil on a superthin pizza? Yes that’s what we want. Exactly that! Of course they can do that for us. Not even 5 minutes later we are munching away on our own version of man’ouche, not far away from the real truth. Our Italians now understand, and yell at us molto bene. It’s just a shame their oven is not hot at right moment: in the morning! …though as well still in Dutch. For this book we traveled in the south of Turkey, Palestine, Israel, Libya, Algeria, Catalunya in Spain and Sardegna in Italy. 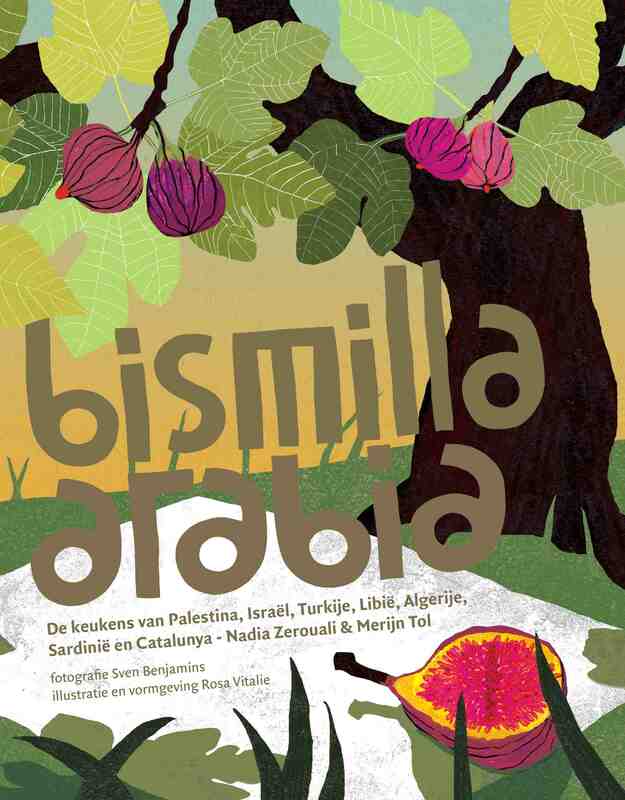 Bismilla Arabia is the fruit of our new understanding of the Arab influence on the kitchen, with so many similarities and differences. 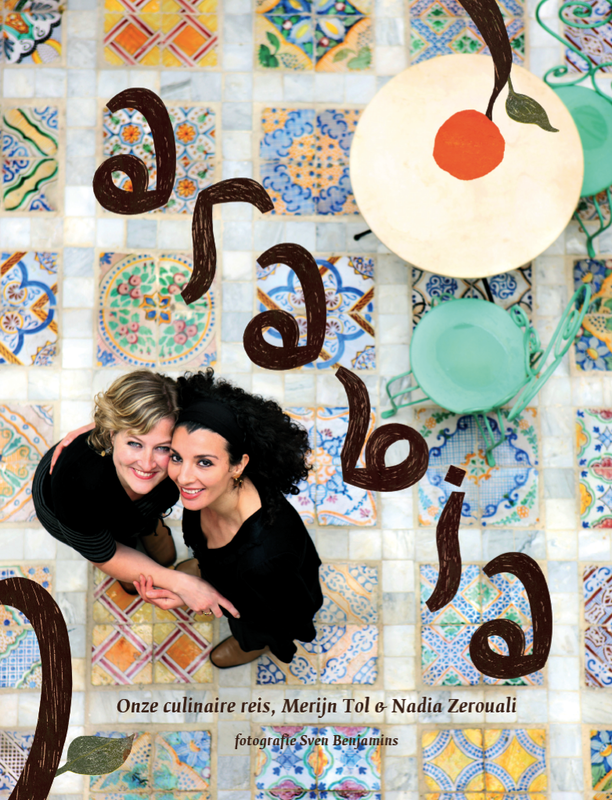 Finally we get on with our stories, not only in our books but we’re gonna try to keep you updated about our search for the Arab influence on the mediterranean kitchen, as featured in our cookbook Arabia (still only available in dutch) for which we traveled Lebanon and Syria, Morocco & Tunisia, Sicily in Italy and Andalucia in Spain. And we have a new one out there since just a couple of days!